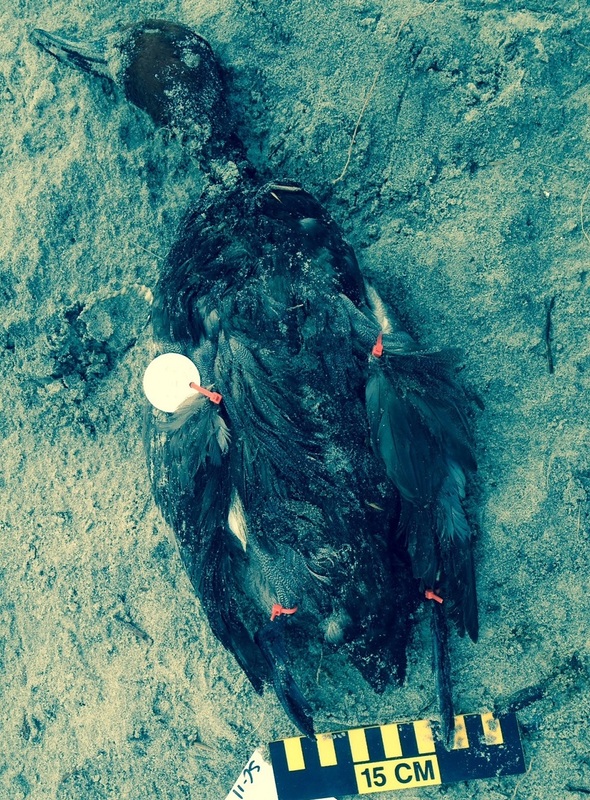 Dead Bird Quiz answers: a battle royale! Or such as we ever get around here. Oftentimes, I choose birds for the quiz that I feel confident in identifying, but that I think offer a good educational opportunity for us all. Other times, I’m just fairly stumped by a carcass and want to get some ideas. Many times, I am gratified that other people with more experience with a given species concur with my suspicions. It’s especially encouraging when multiple players in our quiz all agree as to an identification. But for Bird B in this current quiz, this is certainly not the case this time around. Bird A is a mangled up challenge to be sure. 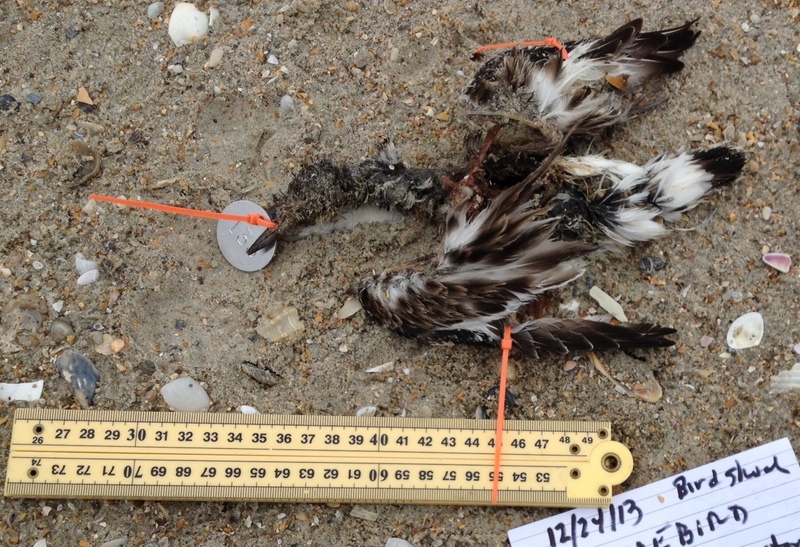 Based on a comparison with the ruler alongside the carcass, I’d estimate the wing chord to be around 14-15cm. That’s a fairly small bird. When I follow my own wing key to try to identify this bird, I end up suspecting it’s a Bufflehead. The size is right (Red-breasted Mergansers (RBME) have a similar pattern of black and white, but they are considerably larger) and the pattern looks good. John Stanton also says Bufflehead, but Wouter mentions another possibility: Hooded Merganser. If you look up this species, it’s size is sometimes described as “bigger than a Bufflehead, smaller than a Red-breasted Merganser.” So the size may be roughly similar to our Bird A. Since the photo of Bird A does not show the wing fully extended, it’s hard to see the details of the individual secondary feathers in that white speculum. The major characteristic that helps sort Bufflehead from RBME is whether the white extends all the way to feather shaft (Bufflehead) or occupies a thinner band along one edge (Hooded Merganser). I can’t tell for sure based on the photo, but it looks like a substantial area on each secondary is white in the case of Bird A, causing me to lean rather further toward Bufflehead. Bird B didn’t hold anyone up, and indeed, was correctly identified as a Wood Duck by finder Linda Rowe. Both Wouter and John (and I) all agree. Now, after that reprieve, back to the harder ones. The light and color balance in these photos is very profoundly altered giving everything a gray-blue cast. Given that the colors are not reading true, I have to guess a bit, but the head actually looks distinctly red-brown to me. The other features I think I can pick out are a bluish bill, some black and gray striation or vermiculation over the back (though not, perhaps, as striking as I might expect from a scaup? ), and a distinct dark breast contrasting with a white belly. If you will suspend your disbelief with me a moment, and entertain my notion that this bird has a reddish-brown head, then perhaps you will not mock and deride me for suggesting this might be a Redhead? I could be missing something fundamental and obvious, so I ask quite earnestly for guidance from our crack team in what else I might look at here. Greater Scaup (back) next to a male Redhead. Imagine them in black and white–similar, no? It’s winter, so it’s high season for dead birds. I know this DBQ is coming close on the heels of the last one, but I just can’t help myself. This quiz has a theme, but I don’t want to reveal it yet. Try your hand at these identifications, and hopefully, the theme will reveal itself. 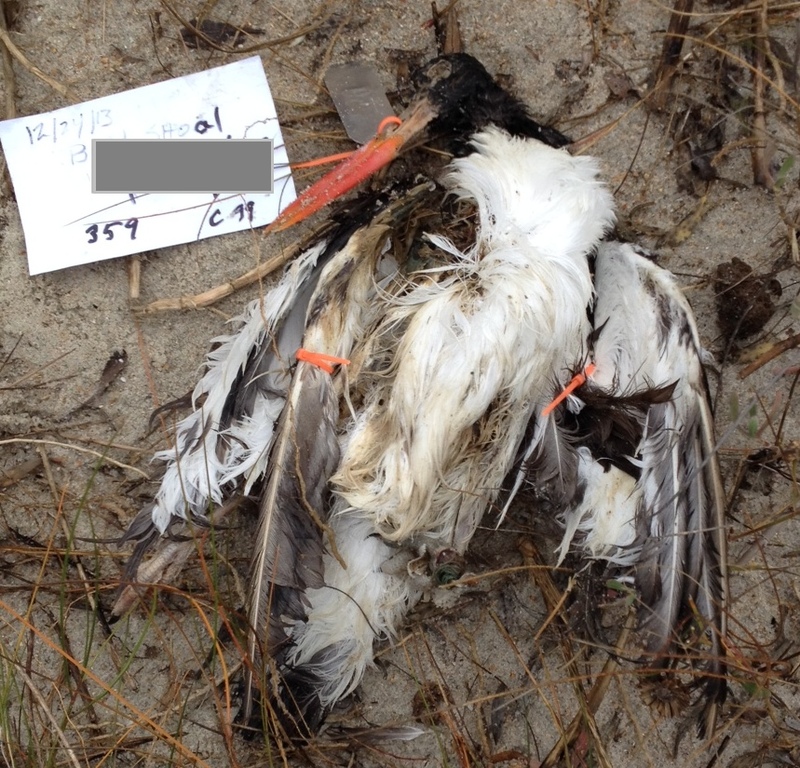 All three birds were found in December, and all by volunteers in the Carolinas. Bird A, found by Stan Rule in North Carolina. Bird B (underside), found by Linda Rowe in South Carolina. 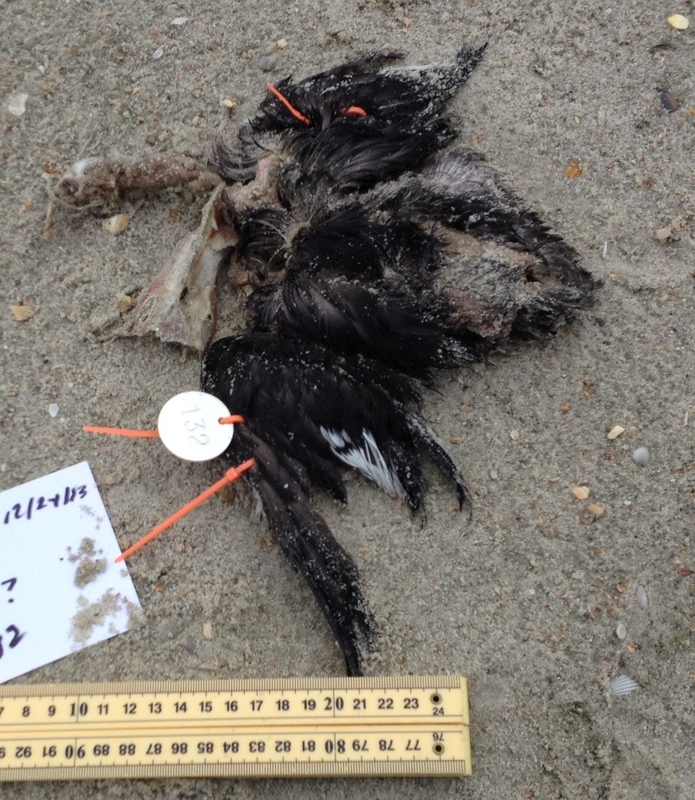 Bird C, found by Doug and Gina McQuilken in South Carolina. 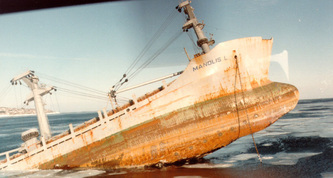 The Manolis L as it went under in 1985. Back in May last year, I posted here about the Manolis L, a Liberian registered ship that sank off Newfoundland, Canada in 1985. Last year, the ship apparently began leaking oil from its current resting place under 250 feet of water around Fogo Island. Remote controlled submersible robots revealed a cracked hull. In July, the Canadian Coast Guard installed a collecting device called a cofferdam on one side of the ship, and a neoprene seal over another compromised area. 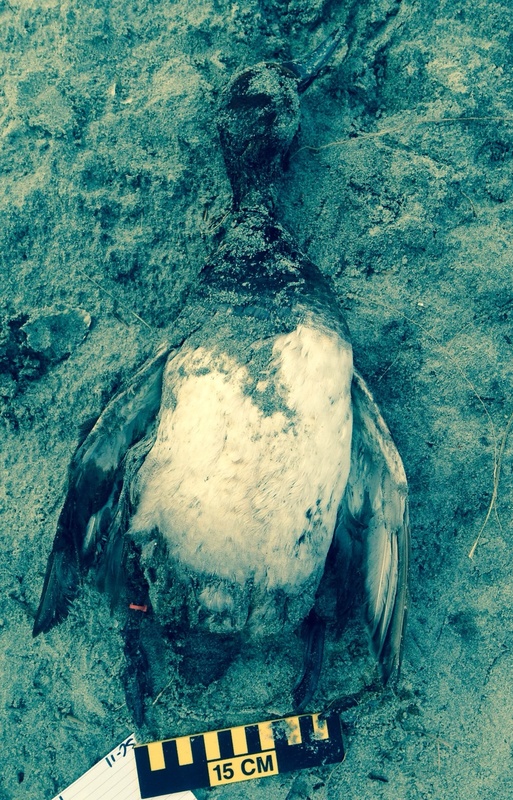 At the end of December, however, locals began reporting obvious oil on the surface of the waters near the wreck, and hunters have been documenting oil on many of the eiders they’ve killed. The Coast Guard responded to this most recent increase in oil leakage by examining the wreck again. They found that the neoprene seal appears to be working, but that the cofferdam has shifted about fifteen feet off the site of the leak. They suggest that recent harsh weather and wave action likely dislodged the device allowing oil to escape. Engineers and oceanographers are currently evaluating potential solutions to this problem, but in the meantime, local residents have been trying to publicize the issue and place additional pressure on their government to address the issue more quickly. One of these citizen groups has formed a Facebook page to allow residents and interested outsiders to follow any developments in the case, and we encourage you to keep an eye on what’s happening with our neighbors to the north. SEANET was invited to follow their site over the weekend, and we certainly will, with interest. We also received a report this week from the other side of the Atlantic, where a beachcombers’ group has begun reporting small plastic discs on their beaches. These discs look suspiciously similar to the ones released from the Hooksett, NH sewage treatment plant back in March of 2011. It’s certainly not outside the realm of possibility that the discs have bobbed their way across the ocean on the Gulf Stream and are now gracing our compatriots in the old country. This is another group we will be following to see where else these discs turn up, and all the other oddities and sad cases our UK friends find. The three birds featured on this quiz represented an escalation in difficulty level, and sure enough the responses reflected that. Wouter got all of them, naturally (and I was very relieved that his answer on Bird C was the same as my own). Several other DBQ players identified Bird A correctly, but Bird B threw many for a loop. Bird A was mostly intact, which makes things vastly easier. That bird was an American Oystercatcher–quite a cool find! We get very few of those reported on SEANET surveys. Bird B was more disheveled and thus a bit more difficult. The straight, sharp beak almost suggested a songbird, except for that rather long neck. More likely a shorebird. The tail pattern jumps out, with that black band juxtaposed with a white rump. The wings have a fairly strong scalloped pattern in a rusty brown color. Were it this bird’s breeding season, things would be clearer, as the species then takes on what is known as a “calico pattern” with sharply demarcated patches of reddish-brown, black, and white. 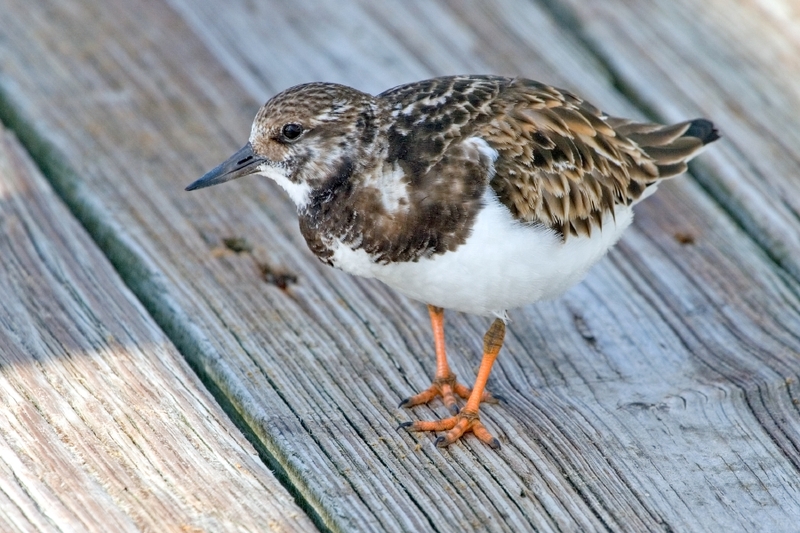 The species we have here is a Ruddy Turnstone, though Bird B is not one of those striking, breeding adults. Other things that may help you make the i.d. if you should meet a similar carcass: these birds have orange legs at all ages and life stages, and the belly, breast and underwing are all a bright, unmarked white. As with many shorebirds, the feet are unwebbed, but the toes somewhat fleshy, at least, more so than they would be in a songbird. Bird C was in terrible shape. 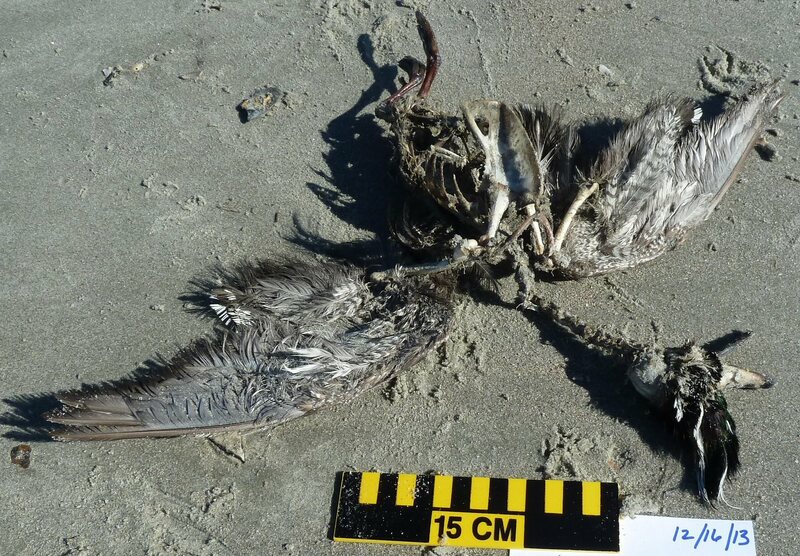 The carcass was extremely weathered, which typically fades the feathers, so this bird was not likely quite so brown in life, but was probably more blackish. The things that leapt out at me were that long, wedge-like tail, and the shape of the sternum. Sternum identification is rather a boutique field of study, and I am a novice, but the sternum shape of the pouch bills (pelicans, cormorants and the like) has certain characteristics that are consistent with Bird C’s. Bird C’s sternum has a forward angled keel, which is common to many of the more gifted diving birds (shallow “divers” like gulls tend to have a very upright keel bone since they don’t need the same streamlined shape to slice through the water like the true divers). In this case, using a foot key would lead one astray since the toes appear unwebbed. In fact, they were, at one time, webbed, and all four toes would have been incorporated in that webbing. But, from what does remain in Bird C, we can see that the 4th, hind, toe is quite long, again, consistent with a pouch bill that has all four toes webbed. 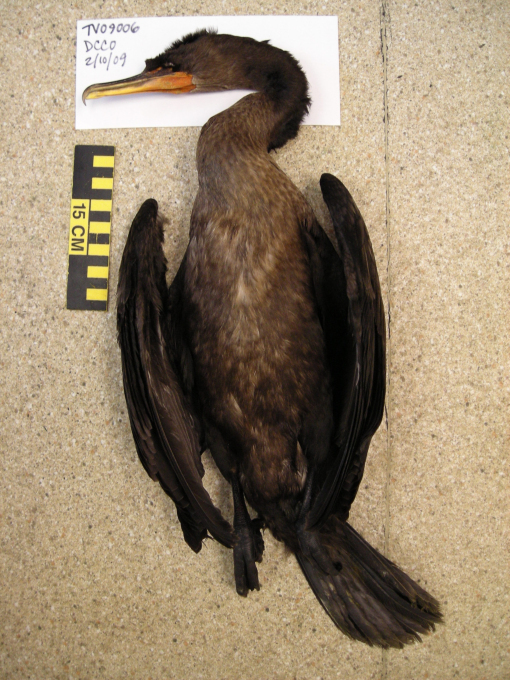 The length and shape of the tail argue for cormorant, but beyond that, we can’t say which kind. We certainly get far more Double-crested Cormorants reported by Seanetters, but we can’t rule out Great Cormorant either. Double-crested Cormorant. Note that long tail and overall dark brown to black color. We’re hunkered down in a Nor’Easter up here in New Hampshire, but I’ve been verifying all your walk reports, Seanetters, and right now, it’s North and South Carolina churning out the birds. So here you are, the first DBQ of the new year, featuring entirely southern beaches. 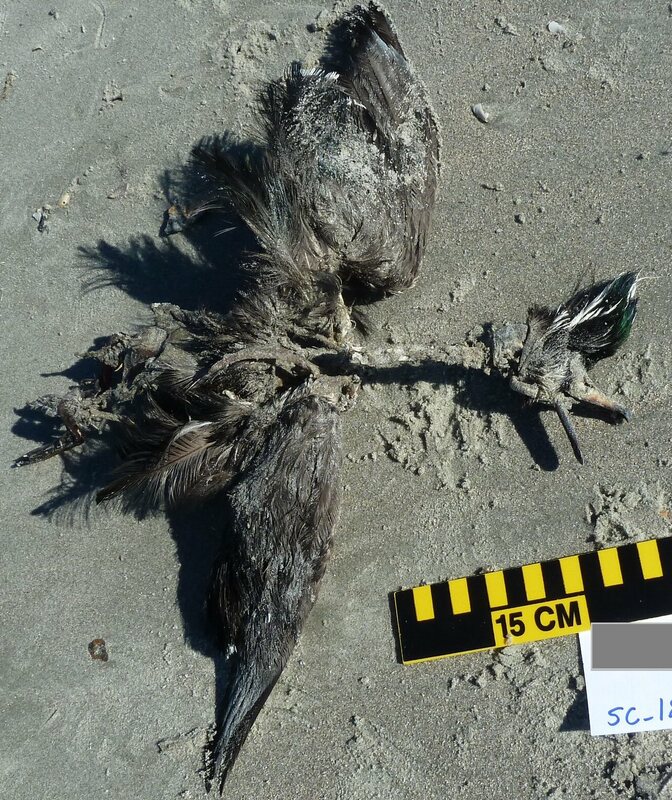 Birds A and B were found on December 24th by Stan Rule who walks a beach by the appropriately named Bird Shoal in North Carolina. Bird C was found by Linda Rowe who walks on Folly Beach in South Carolina. 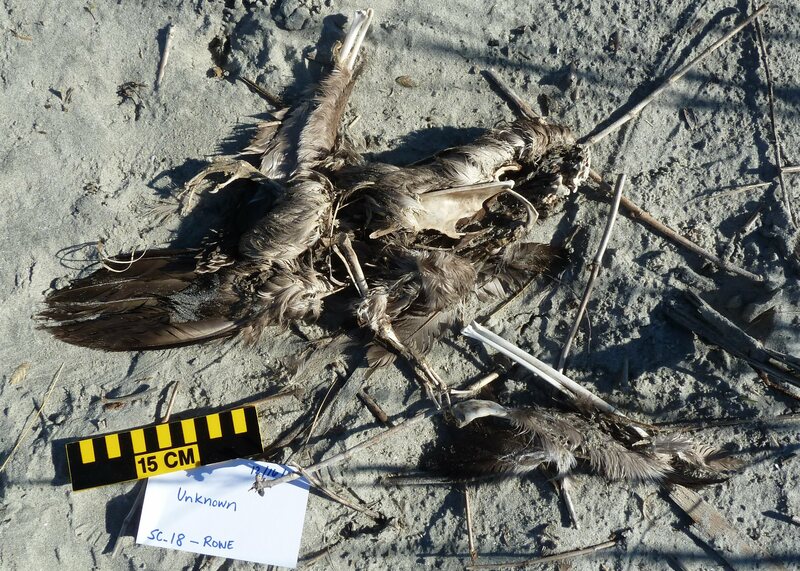 These birds are in various stages of decomposition and decay, so they present variable challenges. Enjoy!